Written by Catherine Saxelby on Wednesday, 06 June 2018. This is an easy way to downsize your portions of meat as you use HALF the mince and boost the flavour and filling power with lentils. 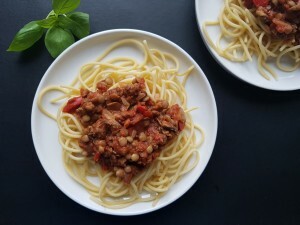 It's a plant-based recipe that works - it adds fibre and slowly-digested carbs plus stretches the meat so it goes further. Plus it's a hearty dish to cook when the weather is cold outside. With 1 tablespoon parmesan cheese: 1,625 kJ (390 calories), 8g fat (2g saturated fat), 55g carbohydrate (8g sugars), 8g fibre and 430mg sodium. Add the red pepper and mince. Stir through for 2 minutes, breaking up any lumps with a large wooden spoon. Lower the heat, cover the frypan and let the mixture simmer for 30-40 minutes. Stir every 15 minutes. About 10-15 minutes before you want to serve up, cook the pasta in boiling salted water according to directions. Drain and keep warm. Serve on to each of 4 bowls and sprinkle with Parmesan cheese.